Do you have a fascination with tragedies? Do morbid tales of death and irony pique your interest? Are you a fan of the macabre, the word that I definitely pronounced ‘MAK-A-BRAY’ until someone corrected me at the tender age of 23? Maybe you’re just a fan of the Addams Family. Well this week’s game is tailor made for you. Welcome to TAY Board Game Night. Each week I bring you a new board game to try out, throw in a short blurb about why you should play this game, and then highlight some alternate playstyles or expansions for you to try. This week is Gloom! I tend to gravitate towards card games when it comes to board games. They just come easy to me. Gloom is a card game that I can safely say doesn’t play like most others. From its thematics to its presentation, Gloom is a unique creature. So what makes Gloom unique? Well for starters, lets look at the cards. Yup, they’re mostly clear. That is so you can stack cards on top of each other, and still see the stuff below it. The core game is thus; You have a small family, and your goal is to make them as miserable as possible. Then give them the sweet embrace of death. Morbid? Yes, but don’t worry, most of the inflictions are played for yuks, and the goal of the game is to have a the largest combined negative score on your family in the end. Along the way your opponents are going to be doing the same, and even hindering your awesome negative score by making your family members Happy. This is where those clear cards come in. Each card has three slots potentially dedicated towards negative score icons. You lay that card on one of your family members, and now they have some negative score. There are a lot of different cards with different amount in each slot. So sometimes, you may have to play multiple cards on on a character before finishing them with a death card, to get the best score you can. Sometimes those slots will overlap, and you’ll have to choose whether losing that -20 score in the top slot is worth -10 in every slot, and so on. Your opponents can play cards on your characters too. Sometimes giving them positive points, or worse, potentially killing them with few negative scores. So now you can see where a lot of the gameplay is from. You’re constantly in a race of developing your disturbed plans for your family, and disrupting your opponent’s plans. Along the way you’ll have a lot of laughs despite the grim outlook, I promise. The transparent cards, and the mechanics they bring are worth the admission. There is almost nothing else out there like it. Gloom has quite a few expansions that add new families, effects, and some extra mechanics that really switch up how the game is played. 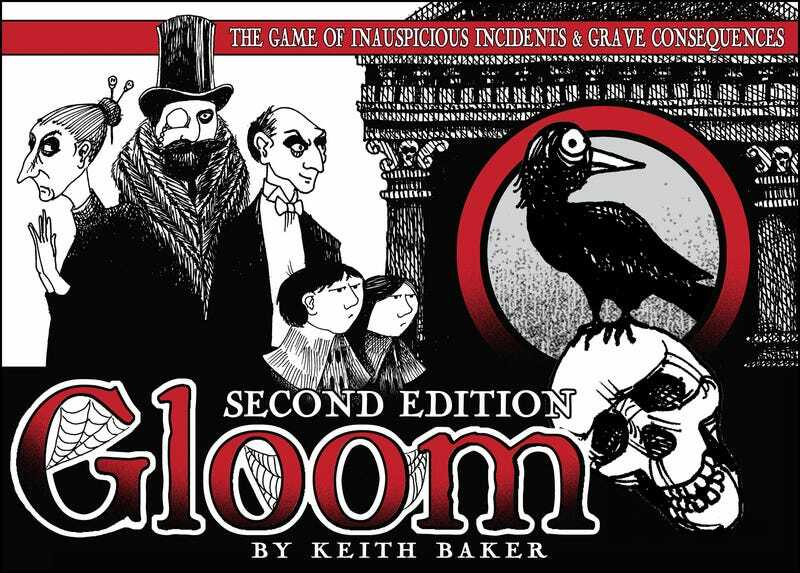 I strongly suggest seeking out the 2nd edition of the core game if you’re just starting with Gloom. Gloom is a very ‘pvp’-centric game, and a dark one at that, so be sure to bring plenty of humor along, even though the game does bring its own fair share! Don’t forget to check out my older TAY Board Game Night posts about tabletop gaming, news, and reviews. Have any questions or news? Suggestions? Tweet me@Eon_Blackcraft or leave a comment below!